Allowing slaughterhouses to run their kill lines at even faster speeds is a reckless decision by this administration that will lead to increased animal suffering, continued worker exploitation and compromised food safety. 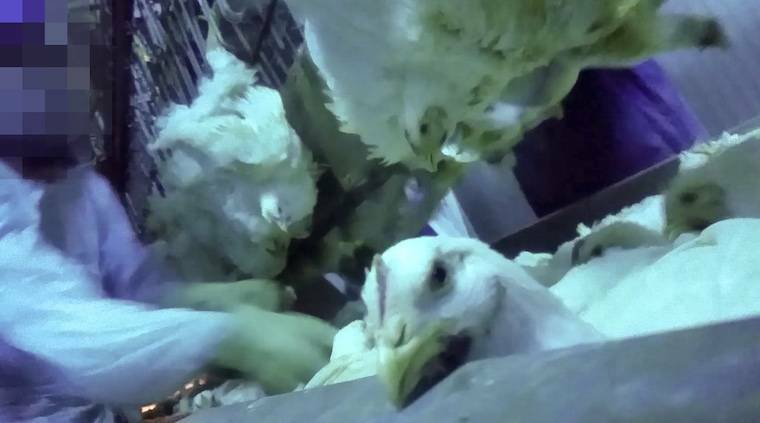 As many as 175 birds are killed each minute at this Amick Farms facility. 0 Image from COK Compassion Over Killing. One of the US’s most dangerous industries is becoming even more hazardous for workers, as animal welfare and consumer safety are also put on the line. The federal government is allowing more and more slaughter plants to kill animals at increasingly dangerous rates. At the end of September, the Trump administration announced that the Food Safety and Inspection Service (FSIS) of the United States Department of Agriculture (USDA) would be granting waivers allowing chicken slaughter plants to operate at higher kill speeds — going from a staggering 140 birds killed per minute (or more than two birds every single second) to 175. COK’s investigator documented workers punching, shoving or throwing birds down the hurtling line; birds slowly drowning in electrified stunning baths during equipment breakdowns; and “red birds,” chickens who were not fully bled out before entering the scalding tank — evidence that they entered the tank while still alive. Birds are moved quickly down the line. Image from COK Compassion Over Killing. A panicked bird is roughly grabbed on the quickly moving line. Image from COK Compassion Over Killing. Other COK investigations have documented birds being improperly shackled, dumped onto the conveyor belt and being roughly handled by workers struggling to keep up with rapidly moving lines. 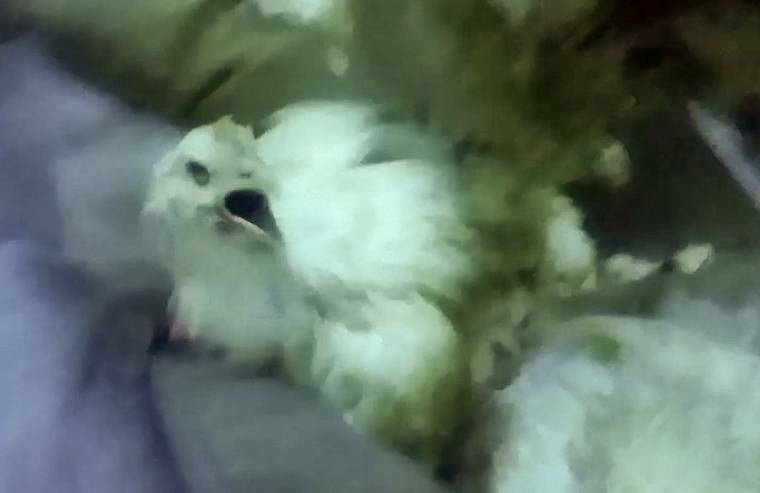 Birds suffer during this short and tragic journey to the kill line — already having endured severely overcrowded and filthy conditions on factory farms where they were bred for unnaturally rapid growth. In addition to the obvious cruelty toward farmed animals in the final moments of their short lives, high-speed slaughter lines also pose grave danger to workers. 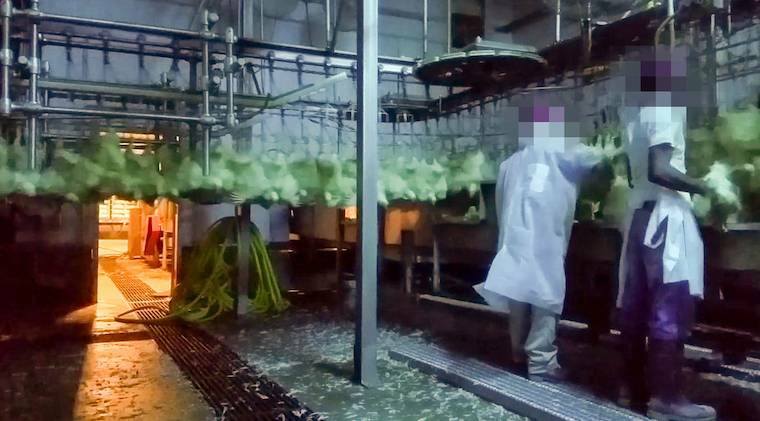 Many employees at slaughter plants are already vulnerable undocumented workers exploited in one of the nation’s most dangerous industries to work. Even at current line speeds, they’re often denied bathroom breaks to keep up the pace at all costs, and can suffer painful medical issues and severe injuries — even amputations. But instead of taking pause to address the dangers of this reckless program, the USDA is expanding it — and not just for chickens. In late 2015, a COK undercover investigator worked at Quality Pork Processors (QPP) in Austin, Minnesota, a pig slaughterhouse that exclusively supplies to Hormel, the maker of SPAM and other pork products. Held up as a model plant for the USDA’s high-speed pig slaughter program — the Hazard Analysis Critical Control Point-Based Inspection Model Project — QPP kills approximately 1,300 pigs every hour. The terrifying truth revealed in undercover footage paints a picture very much like the horrors seen at Amick Farms: pigs being beaten, shocked and dragged to the kill floor. Many were also improperly stunned, possibly leading them to enter the scalding tank alive — just like the “red birds” documented at Amick. In this fast-paced environment, pigs covered in feces or pus-filled abscesses were also seen processed for human consumption — all with a USDA inspection seal of approval. Though animal organizations and workers’ rights advocates alike are fighting these reckless speed increases, and the USDA has received more than 83,000 comments regarding this program — many opposed to it — the enormous lobbying power of the National Chicken Council continues has put pressure on the USDA to eliminate speed caps altogether. The USDA has denied a countrywide increase so far, but there’s little stopping the agency from granting waivers for individual slaughter plants across the United States. Laura Cascada is director of corporate outreach at COK Compassion Over Killing. She works to increase the availability of vegan options nationwide and bring about positive changes for animals in the meat, dairy and egg industries.